Viewing time: 3 mins. 48 secs. The Write Question is a weekly video podcast all about writing. 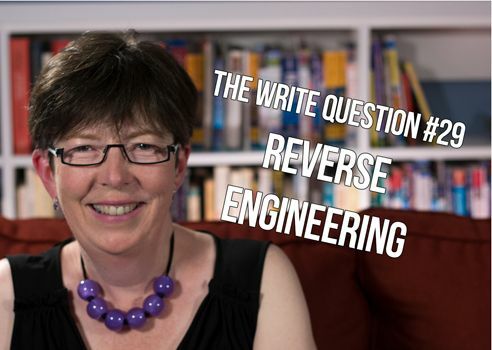 Today’s question focuses on reverse engineering for writers. If you have a question you’d like me to answer you can email me at daphne@www.publicationcoach.com, tweet me @pubcoach, or leave a message for me at the Skype account, The Write Question. Welcome to The Write Question, I’m Daphne Gray-Grant. If you’re a writer, math and science may hold a particular terror for you. But I’m going to try to persuade to embrace your inner engineer. [recording] Hi Daphne, I was wondering if you can offer me some advice regarding the following: I find I have a hard time managing writing projects of say three months. I seem to plug away at the task every day but all of sudden the deadline has crept up on me and I’m nowhere near finished. Thank you for your feedback. Thanks for the question, Judith. Twenty-five years ago, when I was a journalist in daily newspapers, a three-month deadline sounded like an unimaginable luxury. I was lucky if I got three hours! Today, however, I’m self-employed and doing a slightly different kind of work and I face longer term deadlines all the time. And I now understand they are not as easy as they look. It’s so tempting to delay and procrastinate! Even worse, it’s so easy to work incredibly hard and STILL not finish on time. When I edited a book 25 years ago, I learned the trick of reverse engineering. It has saved me so many times. So how do you do it? Start by writing down the date of your ultimate deadline. Then go two days before that, and consider this your actual deadline. These extra two days are designed to give you a cushion if anything goes wrong. But be sure to treat this new day as the “real” deadline. Now, here’s the reverse engineering part — turn your list upside down and attach a deadline to every task. Before you can do this you must also sort out how much time you’re going to need to devote to each step. After all of that, your list might look something like this. The reason reverse engineering works is because it holds you accountable throughout the process. Without regular deadlines for a project like this, I wouldn’t have felt any anxiety which would have been good. But I might not have had any urgency, which would have been bad. If you’re failing to accomplish steps along the way, this timetable will make you aware of this problem. Then, you’ll be able to make decisions that will still help you meet the ultimate deadline. Maybe you need to tighten your focus or otherwise cut some corners? Maybe you need to devote more daily time to this project. If you reverse engineer your project early enough in the process your life will be easier and the material you’re writing will be better. Thanks for your question, Judith. Good luck with building your project from the ground up!